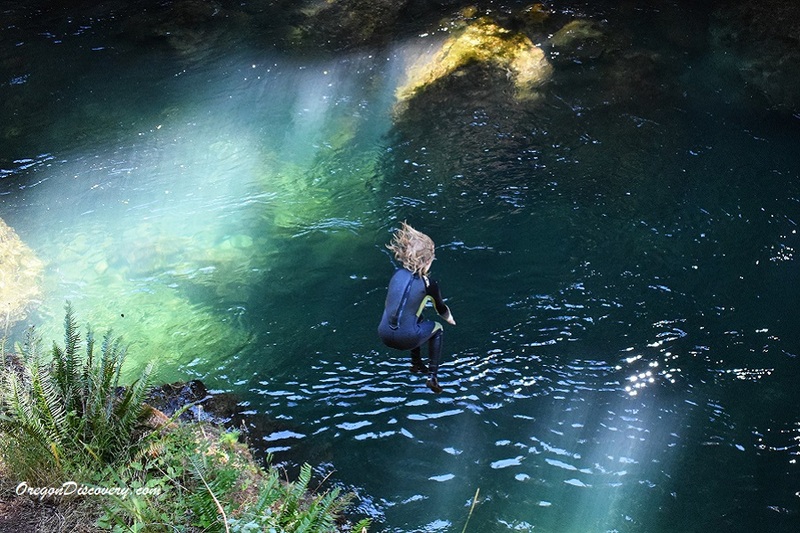 There are several deep swimming holes along the Salmon Creek in the Willamette National Forest near Oakridge, 40 miles east of Eugene. Astonishingly beautiful deep pools with the crystal-clear blue-green waters above Salmon Creek Falls (official name is Salmon Falls) are good for swimming and cliff jumping. The broad moderately high volume fall is about 8 feet in height. The water is rough below the falls and swimming here is not considered to be safe. The bank above the falls is composed of formation rocks, and below the falls consists of large pebbles and small boulders. Popular among travelers and local residents, Salmon Creek Falls Campground and Day Use Site are located nearby. The Salmon Creek Area provides an excellent opportunity for hiking. A totally 12-mile-long trail with easy and moderate sections designated for hikers with any experience. 109 miles southeast of Salem. The day-use area is located inside the campground.